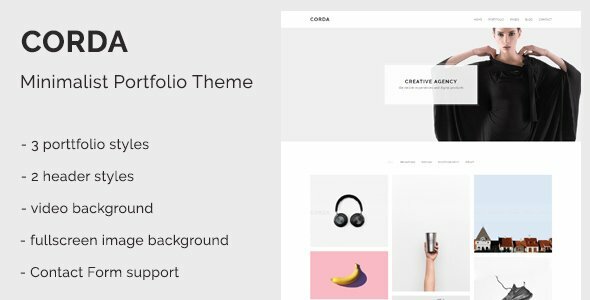 Corda is a clean and minimalist portfolio theme designed to help you put your work in the spotlight. Feature packed and very easy to set up, you’ll never have to look for another theme again to present your portfolio. Are you a member of a small agency or a freelancer? Corda is here save your precious time and get your online portfolio up and running in no time. We understand the need to present your projects the best way possible. That’s why Corda focuses on a minimalist design which focuses on the content. With our very own portfolio plugin included, all your presentation problems will be over. With three portfolio styles at your disposal and two header styles, you’ll be spoiled for choice. With support for YouTube videos and fullscreen images in the header, you can create more dynamic project pages. We have also included support for contact forms as well as Google Maps to complete your online presence with necessary details.